Many athletes seek us out because they have difficulty taking their practice game performance to competition. They develop confidence from practice and training, but when they step onto to the soccer field, practice confidence dwindles fast. Some athletes simply get trapped in a practice mindset—they over-analyze their skills. They cannot let go of the practice mindset and forget the REAL purpose of training and practice. This mindset is common for soccer players who are determined to be the best and are always working to improve their performance. They focus on improving their skills, but don’t know when to stop. You play with confidence in practice, but fail to exhibit the same levels of performance in games. You enjoy practice more than you enjoy the thrill of a close competition. When competing, you try to hard to make the “right” decision, make the best pass, or shoot with perfect technique. You are overly focused on future improvement. You work too much on fixing what may be wrong so you can play better the next game rather than trying to get the most out of your game today. You become very analytical about mistakes and dwell on errors. You spend too much energy trying to fix your technique that you lose sight of the real objective. For example if you miss a shot, you dwell on how it could have been better. You simply can’t trust what you have practiced or trained. You are worried about mistakes and so you play safe. World-class soccer players balance a training mindset with a competition mindset. They are dedicated to training and improving their skills AND have the utmost confidence in their ability when they compete. During training they work on technique and how to improve, but come game time, they trust the skills they have—they stop analyzing and just play. You now understand that having a balance of the practice and performance mindsets are necessary to achieve your potential in soccer. It’s fine to strive for perfection and want to improve each day, but when you take this mindset to an extreme, it can cause you to over-think your performance in competition. 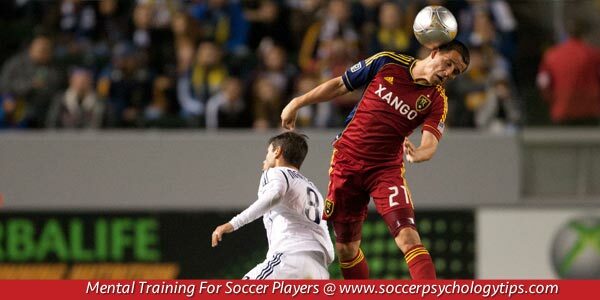 Your soccer mental game tip is to let go of practicing your game when it’s time to play in a game. Have confidence in your training, let go of mistakes, and don’t think about technique until after the game. A “gamer” is an athlete who trusts his or her skills and performs as well or better in competition. This should be any soccer player’s goal. Performing with trust in competition is just one aspect of having a strong mental game.